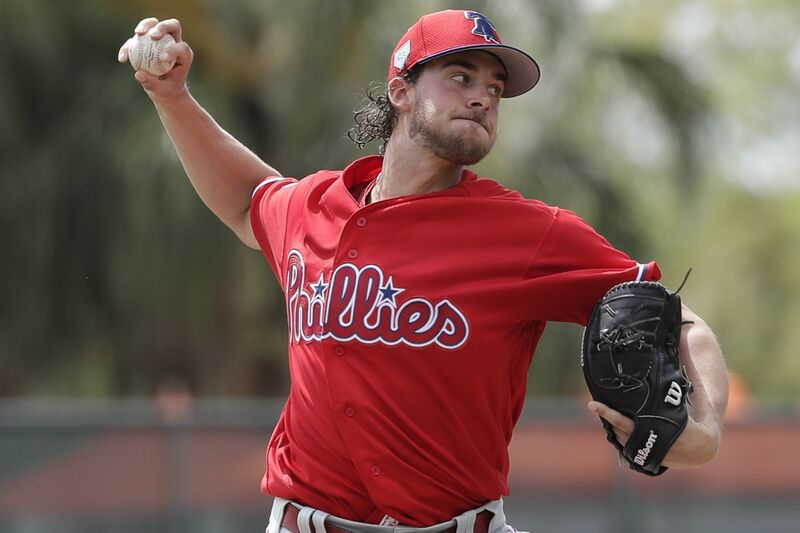 Aaron Nola pitches in the first inning of Sunday's Grapefruit League game against the Orioles. SARASOTA, Fla. -- Aaron Nola was in the dugout on Saturday afternoon when a sold-out Spectrum Field greeted Bryce Harper with a standing ovation. He could feel the crowd’s energy from his perch on the top step. But this was just a Grapefruit League game. Imagine, Nola was asked Sunday, what the scene will be later this month when Harper makes his debut in Philadelphia and Nola is on the mound for opening day. Nola, in his second start of spring, struck out six batters on Sunday as he pitched the first three innings of an 8-5 win over the Baltimore Orioles. He gave up four hits and three runs. He struggled with his fastball command early on before making adjustments. Nola was happy with his curveball, which had its signature movement. Nola learned on Friday that he will start for the Phillies when they open the season on March 28 against the Atlanta Braves at Citizens Bank Park. Manager Gabe Kapler called Nola in the afternoon and the conversation was not a surprise. Nola started opening day last season and went on to take his place among premier arms. It may have been the easiest decision Kapler will have to make this season. Bryce Harper will play Monday, Wednesday, and Friday this week. Still seeking his first at-bat after working a pair of walks on Saturday, Harper will start Monday in right field against Tampa Bay and is expected to stay in the game for two plate appearances as he continues to get into game shape. After Saturday’s game, Harper was asked about his interactions this spring with Gabe Kapler. “When we faced him last year in September and they had like 45 guys or whatever they had in the clubhouse, switch this guy, switch that guy and our game was like 5½ hours, so it was kind of tough to be able to go, ‘Oh yeah, I like this guy.’ But no, he’s great,” Harper said. Cesar Hernandez (hip flexor) and Odubel Herrera (strained hamstring) are progressing, Gabe Kapler said, and could play in a Grapefruit League game within the next five to 10 days. ... Reliever Tommy Hunter felt fine Saturday after playing catch for the first time since suffering a flexor strain in his right arm. His status for opening day remains uncertain. ... Nick Pivetta struck out four batters on Sunday and allowed two runs on three hits in four innings. ... Trevor Plouffe and Phil Gosselin homered, Andrew Knapp went 3-for-5, and Nick Williams drove in two runs. ... Vince Velasquez will start Monday in Clearwater against Tampa Bay. Blake Snell, last year’s American League Cy Young winner, will start for the Rays.